Wow! A lot has happened over the last day and a half. Sheralyn's cell phone died, so I haven't been getting updates as often as I would like - so missed yesterday's blog..... Let's catch up! 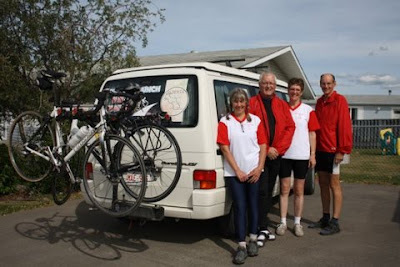 Friday, Sheralyn and Alan rode from Drayton Valley to Whitecourt alone, while David and Helen drove to Edmonton for repairs to their van and bikes. The van window will take a week, so they will have a cardboard and duck tape window for the rest of the trip. Helen's bike was repaired, but David needed a new one. They also purchased a new carrier for their bike. Everyone met in Whitecourt Friday Night. 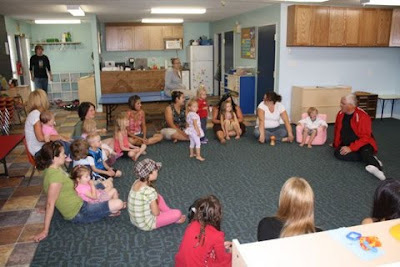 Saturday, they all made a presentation to the Indoor Playground Society in Fox Creek. The society had arranged for parents and children (age birth to 8) to be in attendance. 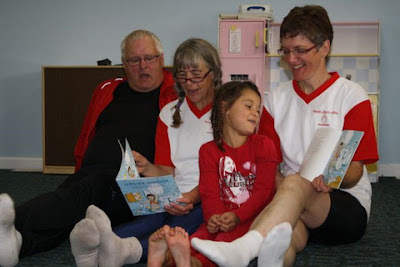 The parents and children all participated in the readings. It was a lot of fun. The photos were taken by Brandi Bedson, who is the photographer and reporter for the Fox Creek TIMES, http://www.foxcreektimes.ca/. Apparently David took some photos, but his camera is not digital - and he didn't have any film in it... :<(. Brandi graciously volunteered her photos. Thanks Brandi for the great photos! Sunday Morning, Alan and Sheralyn attended a service at the Valleyview United Church, while David and Helen did the same in the United Church in Fairview. Presentations were done in both churches. Apparently neither Alan or Sheralyn are singers, so the congregation was kind enough to help with the singing of "I'll Love You Forever". Monday, the team hopes to make it to McLennan. 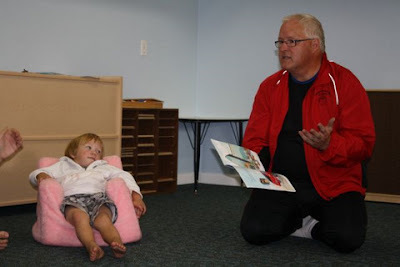 Nothing like a Robert Munsch Story! Ready for the next leg of the journey! These Photos by Brandi Bedson!